Shariputra, form does not differ from emptiness; emptiness does not differ from form. Form itself is emptiness, emptiness itself form. Sensations, perceptions, formations and consciousness are also like this. The scientific method is one basis for understanding the universe but is subject to the same delusions as all mind phenomena. The powerful tools (and key delusional opportunities) are: the application of direct measurement and observation, the introduction of mathematical modeling, and the requirement that hypotheses should be testable and verifiable. The results from experimental studies of astrophysics, quantum physics and evolution have been repeatedly tested and verified by measurement and observation. Using these tools we have assembled a model of reality that comes dangerously close to Kipling’s Just So Stories for children, the fantastic accounts of how various phenomena came about. Analogously, the anthropic principle suggests that our universe was made the way it was so that we could be in it and understand it. Quantum mechanics can tell us the size of the smallest particle that could exist without collapsing into a black hole (it’s on a scale of 10-32) and can also give exquisitely accurate probabilities that describe large collections of particles and their behavior, but predicting the behavior of a single particle cannot be done. In 1927, Heisenberg raised this notion of uncertainty to a fundamental physical principle. The more accurately the position of a particle is known, the less accurately is its velocity, and vice versa. A consequence is that there is no such thing as empty space, because a particle’s position and velocity cannot both be zero. So “empty” space is subject to “quantum fluctuations,” where particles quiver in and out of existence. We can call it quantum impermanence, where matter comes out of nothing and disappears, just like us. On the largest observable scale, with its 1078 atoms, the universe appears uniform in all directions to a few hundred thousandths of a percent—no matter where one is located in it. All of the stuff that we can measure—matter and energy, the formation of all structure—constitutes only about 4% of this universe. Dark matter, which neither emits nor absorbs light, but whose existence can be inferred from the massive gravitational forces it exerts on objects we can see, accounts for about 28%. Dark energy, a mysterious property of space that causes the expansion of the universe to accelerate instead of eventually slowing down due to the attractive force of gravity, is 68% of everything. The 4%—the 400 billion galaxies, each with about 400 billion stars—seems to have been created out of nothing, from quantum fluctuations in the density of the plasma (a hot soup of radiation, electrons and protons) of the early universe. These tiny variations of reality expanded enormously (by a factor of 1043) in a brief period of cosmic inflation after the big bang about 13.7 billion years ago. 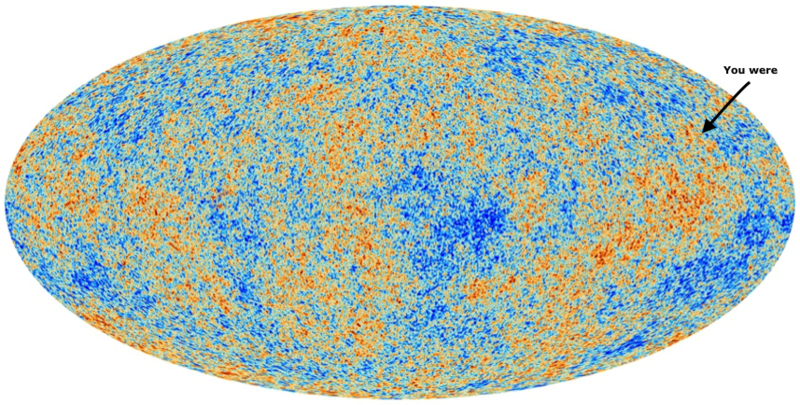 The remnants of these variations can be observed today in what is called the cosmic microwave background radiation—created 380,000 years later, when the universe had cooled enough so that light could escape the plasma. But had the variations been too small or too big, all the matter and energy of all the galaxies, stars, planets, humans and everything else would not “exist.” Of course, Buddhanature, the selfless interdependence of all, existed from the start and continues despite the nature of the stuff that persists or vanishes. If all beings are one, where did the carbon, oxygen, nitrogen and other “heavy” elements that compose our bodies originate? A star died so that you could be born—in fact, multiple supernovae died, and the atoms in your left hand probably came from a different star than those in your right. During the history of our galaxy, about 200 million stars have exploded, creating all the elements heavier than hydrogen, helium and lithium by a process in which atomic nuclei collide and form heavier nuclei. So you and every being are literally all-is-one, having been formed and recycled many times from atoms created by supernovae from stars previously created from nothing: Buddhanature—codependent arising. All life on earth, whether currently alive, dead or extinct, has descended from a series of common ancestors. All experimental data, from molecular to paleontological and anatomical, support this fact. Everything and everyone alive today are the oldest living beings, with the genetic material inherited from our parents forming an unbroken line of ancestry connecting us to the first organisms living on earth billions of years ago. Some of our genetic information is shared with every other living being, so part of us is in all of life and eternal, whereas any one life is transient. We began as all-is-one, and in successive branches of the tree of life we remain all-is-one, both ancestors and progeny of other beings countless times. All beings are interconnected. The surprising aspect of this view of reality is that its basic architecture has emerged from two quite different directions of the human mind—one from contemplative approaches like Buddhism, the other from the most complex technological scientific investigations of the material and energetic universe that we can observe in its animate or inanimate nature. In both approaches, the underlying architecture has a strong dependence upon causality as a driving force, and there is no need for actions of a “Creator God” to make the system work. Proponents of “intelligent design,” on the other hand, posit that life forms, especially humans, are too complicated to be explained by such linked causal processes acting over vast periods of time, hence a Creator must have been involved to fashion something as exquisite as an eye. Yet despite the apparent complexity of life and the current understanding of evolution, the causal processes of evolution comprise the only explanatory mechanism that embraces all of what we currently know about life and the universe. Certain aspects of evolution, such as the mode, tempo and mechanisms of change, are still active areas of research, but the fact that our knowledge is imperfect is not sufficient to impose an imaginary Creator to fill in the details. For example, the physics of Isaac Newton and James Maxwell were inadequate to explain the universe at its smallest and largest scales, where space and time are interdependent. Indeed, many scientific models of reality have been revised over the millennia of human thought, including everyday concepts of reality, space and time. Biologists consider the notion of intelligent design to be misleading and simply the latest attempt by religious fundamentalists to thwart accurate scientific education. The nature of the universe is the subject of continued scientific pursuit, whereas creationism and intelligent design are immutable religious beliefs not subject to investigation. Delusions are inexhaustible. Dharma gates are boundless. Given the enormous number of stars and the discovery of planets like ours orbiting them, Earth is certain to be only one of many places in the universe habitable by other life forms. The 13.7-billion-year-old universe we observe in the present moment is astonishing and worthy of investigation without invoking any divine beings to be running it, and Buddhism and scientific exploration provide an explanatory approach to understanding this apparently miraculous reality. As-It-Is now, and the practice of realization, are enough. Tom White is a member of the Everyday Zen sangha. For many years, he researched the genetic relationships among various forms of life and also applied that information to develop tests to diagnose human diseases.